Explore this site if you're interested in scaling up collaboration and innovation, or in the analysis and graphic presentation of complex datasets. In The Long Tail, Chris Anderson noted how internet technology, by reducing transaction costs nearly to zero, forever changed book and music retailing by making it feasible to offer a "long tail" of valuable content. In direct analogy, we have observed strong and consistent behavior patterns in scaled-up collaboration systems that span companies and industries. There is a very strong Long Tail of innovation that has direct consequences for strategy and expectations. This is one of the topics in my experience and research that you can read about here. Why the dog?The Economist once noted that the only way to sell business books in the U.S. is to include a number or animal on the cover. My own experience is that this actually works: people remember the dog. 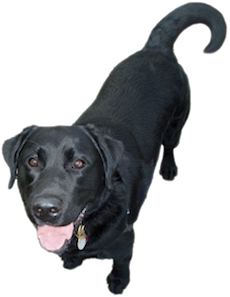 Besides, Mr. Darcy the Labrador is short, dark, and handsome -- and has a long tail. Check out the examples here. We have tag clouds, Venn diagrams, ribbon diagrams, dendrograms, treemaps, and more. Innovation has a serious history and literature; don't pretend you know how to foster it until you make a passable attack on that reading. There are definitely best and worst practices; it is far better to spend a few days reading the thoughtful experts than repeating others' mistakes. Most of the presentations here have references on the slides or at the end. Frederick Taylor and Alfred Sloane taught us all "push" management which remains the norm. Voluntary collaboration is, in contrast, all about generating and working with "pull." You will fail if you use push tactics or don't appreciate the difference. The challenge model, or diverge-converge model, is a proven method consistent with "pull" strategies. The key elements are (i) identifying the right sponsor, (ii) asking a good question, (iii) working with the motivators and roles you have. Innovation is about "new and useful". Saving time and money in new ways is useful, so it's innovation, just like making new products (don't get hung up on pedantic definitions). Don't squawk about "breakthrough innovation only", that's based on 20-20 hindsight and Peter Drucker will tell you it's bogus. Remember Tom Peters: what matters is a bias for action. Outside or Open Innovation sounds great but people have their separate motives and we live in a world of IP and lawyers. So you might start with supply chain optimization: work with vendors, partners, suppliers to do things better (win-win), while you gain confidence in open IP management. Participation in large-scale voluntary collaborations obeys a power law across all companies and industries (the Long Tail of Innovation). Simply put: half of your content comes from people who contribute only once to your project. This has huge consequences for your tactics and expectations. Don't rediscover hard-fought truths about engagement and motivation. Read Herzberg and all the Gallup books, Peter Drucker, Gary Hamel, and Tom Peters. It doesn't matter that they used pencils or typewriters instead of texting; take their advice seriously because basic motivators and behaviors don't change. Most current web-based review systems are badly biased, prone to extremes and driven by an avid minority. That may be adequate for mass retail (music, movies) but is dubious for internal serious business advice. There are ways to do much better, however. Just because you use web technology to communicate and run challenges doesn't mean it's social networking or a rant-and-rave blog. It can be easy to use, engaging, and still be serious and goal-oriented. Run away from tambourine people who have a different fuzzy agenda. Many things have intrinsic, irreducible complexity. Accept it, embrace it, manage it, don't dumb it down. 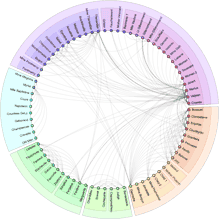 You'll find a variety of display types, some familiar and some original: Venn diagrams, treemaps, dendrograms, more. The code is all available in the source of the HTML demo pages. You may use it -- with attribution! I try to be agnostic but make no apologies if some things don't work in IE; it's just too slow and fussy and its versions need endless custom hacks. The graphic options in HTML5, Canvas, and CSS3 are so tempting that you'll see more and more usage here. Everything will work in Safari, Firefox, and Chrome. Again, contact me if it's important. Ask me if there's something that doesn't work, that I got wrong, or you don't understand. I won't open a blog; no time for spammers. But useful comments and changes will appear here, and I appreciate them. Venn Diagrams and Ribbon Diagrams convey proportion and overlap. Circular Venns are easy to interpret but tricky to draw accurately and essentially limited to three regions. Thus I invented "ribbon" diagrams which are always accurate and have no restrictions. Simple animation hints at business applications: "What if we made this change?" 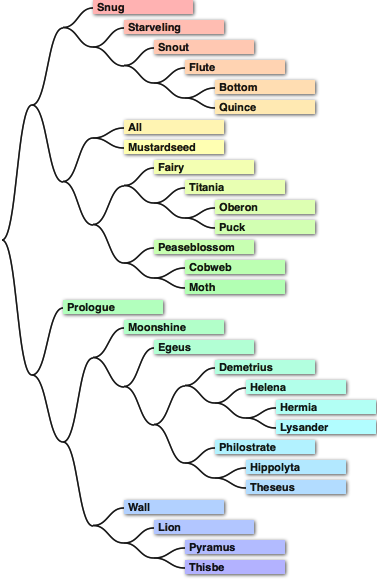 Dendrograms (linear and circular) portray data in tree structures, which are often built from inter-object distance data. One-click examples include social distances in Shakespeare and distances between cities. 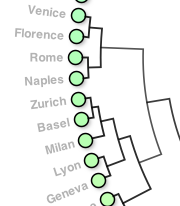 Treemaps can be used to represent the same data but in a rectangular form. Because the compact 'folded' form can obscure distance relationships in the data, color and hover-over backtracking are used to compensate. A fractal map is my own hybrid, a dendrogram folded into a rectangle. Because it's truly self-similar, clicking will zoom in and out and let you get a good sense of depth and distance; you'll find both colored-block and wrought iron variations here. Identifying communities in data is relevant to social network analysis, search strategies for skilled employees, and much more. Here is the first (to my knowledge) client-side implementation of an efficient, highly-regarded algorithm. I've also made it recursive so that all sub-communities are accurately identified as well, and have put all of the information into a single "ring graph" that invites you to explore and consider the connections. Large scale voluntary collaboration has a robust power-law signature which can be reproduced by a very simple checkers-on-a-checkerboard model. The model has only one variable parameter which is a measure of self-vs-group positive feedback. When combined with the observed data for Twitter, Wikipedia, and our many business challenges, the math behind the model lets us put numbers and limits to human narcissism and altruism. You know there's something to think about when models this simple have implications this vast ! Nonlinear projections offer a general way to display large data spaces in a limited view, in direct analogy to the way a fisheye lens squeezes an entire forward view into a circle. This demo has all of the necessary geometry and primitives for drawing lines, rectangles, and circles in a distorted space. User mouse clicks are located in the data space, which initiates an animated change of viewpoint to bring the new object "under the lens." It looks complex but the geometry is simple. 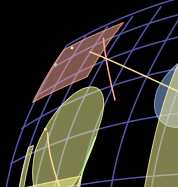 More geometry: cubic bezier curves can be easily connected to draw smooth spline curves, either open or closed. The literature on making splines is complex and formally algebraic, which is curious because there's a very simple geometric solution. This demo animates the single adjustable parameter to show the range of curvature possible. This is my personal website where I'm happy to share two of my passions: scaled-up innovation and data representation. Both have been important in my first career as scientist and manager at Syntex and Pfizer in the pharmaceutical industry, but they have application far beyond drug discovery which is why they're at the core of my next career in Imaginatik. Look through the site, take what you wish (with attribution and respect for copyrights please), and if you want to begin a conversation, don't hesitate to contact me. Anything here that was produced while I was employed has been cleared for distribution by that employer. I'm open to conversations and collaboration along the topics you see here; I'll be straightforward about conflicts of interest and so non-competing contacts make most sense. Possibilities include consulting on innovation processes, quantitative information displays, and more. You can also find a traditional resumé here.